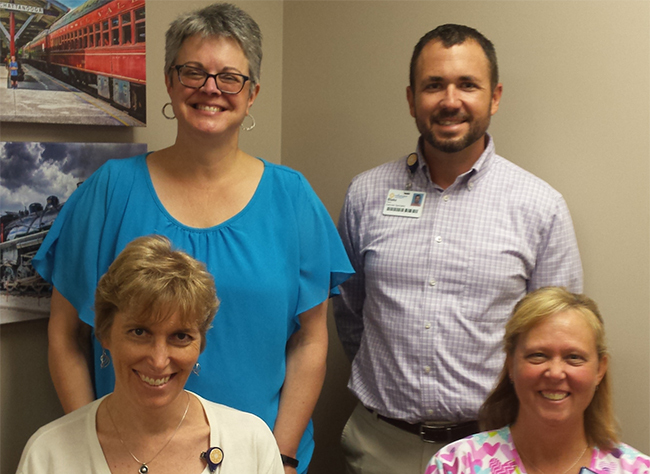 Welcome C-HEAL Adolescent Metabolic and Bariatric Surgery program! We’re proud to introduce the newest member of the Erlanger Metabolic Center: the Childhood Healthy Eating and Active Living Center! The C-HEAL team is made up of Dr. Joani Jack, Pediatrician and Medical Director; Dr. Curt Koontz, Pediatric Surgeon; Jaime Lacey, Registered Dietitian; Blake Pierce, Exercise Specialist; and Tammy Goodner, Medical Assistant. We see patients at Erlanger East Hospital and Children’s Hospital at Erlanger — and will be moving to the brand new Kennedy Outpatient Center in December. Medication Options: Based on growing research, medication options to help treat the disease of childhood obesity are more widely available. These aren’t “diet pills”; rather, they work in the areas of the brain that control appetite, the feeling of fullness, the level of energy, and much more. Making changes in diet and physical activity is still the first-line treatment, but if your child has made lifestyle changes without success, please don’t give up! Please let us know if you are interested in this treatment when you come in to see us. Surgical Options: Several recent studies have shown that the use of minimally invasive bariatric surgical procedures (the gastric sleeve) in teenagers is very effective. This procedure leads to an average weight loss of 25% of the total body weight, plus, other conditions like diabetes, high blood pressure, snoring and high cholesterol go completely away in many patients. We started a HEAL Adolescent Metabolic and Bariatric Surgery program in February and continue to see surgery patients once a month. If you are interested in this option for your teenager, please request a HEAL surgery clinic appointment when you call to make an appointment. If you are concerned about your child’s or adolescent’s weight and would like to schedule an appointment, please request a referral from their primary care physician or contact (423) 778-5767 or (423) 778-KIDS.